I chose to cut the largest of the Wonky Squares out of Kraft cardstock, which makes the focal images really pop. 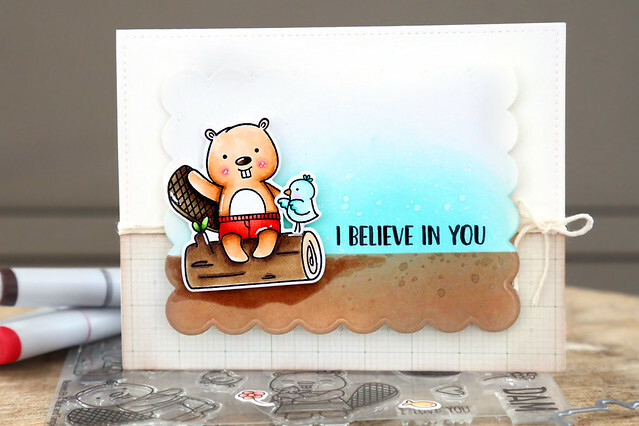 I colored them in primary colors and used a soft brown ink to sponge color onto the white borders, so that it blended into the kraft background a little more. 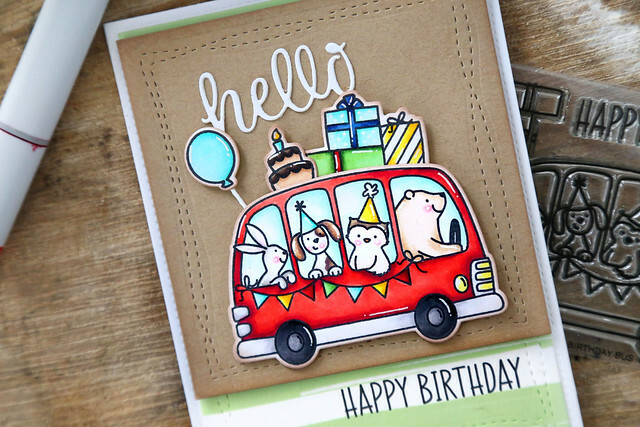 Underneath the kraft layer, I stamped the birthday sentiment included in Birthday Bus, and used the rectangle Wonky Stitches die to cut out that layer. I love that it sort of mimics what is going on in that focal layer. 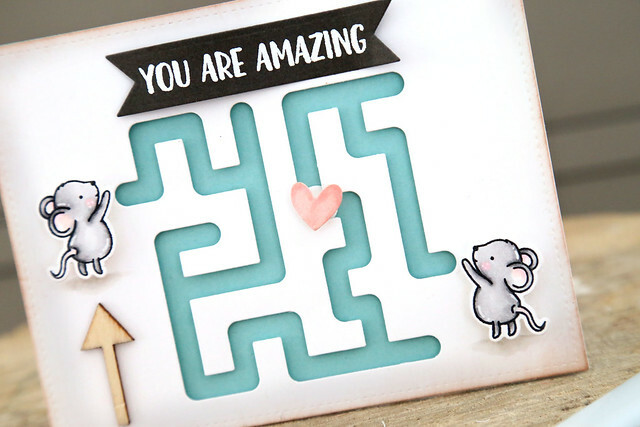 To finish off, I added the "hello" die-cut, also found in the Wonky Squares set. 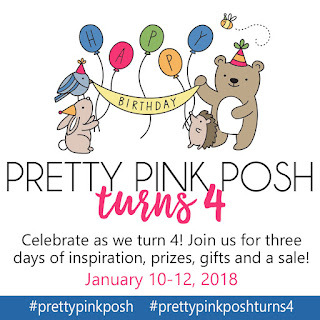 I'm thrilled to be joining in to celebrate Pretty Pink Posh's 4th birthday in a 3-day blog hop event! 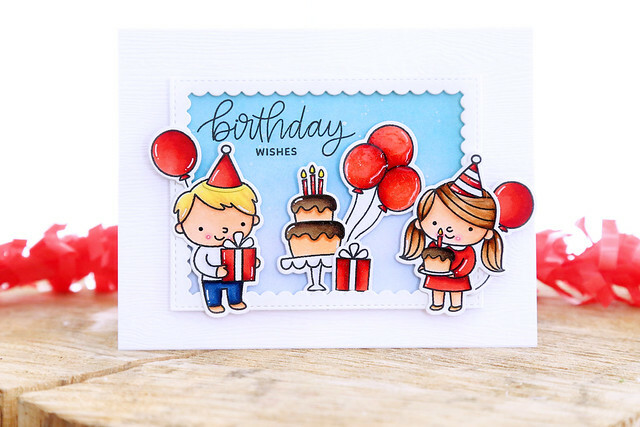 My first card shows off the new set, Birthday Friends. They are so adorable! I used a Scallop Frames die to in-set the birthday cake and had the party-goers stay at the front. This guy is my fave. 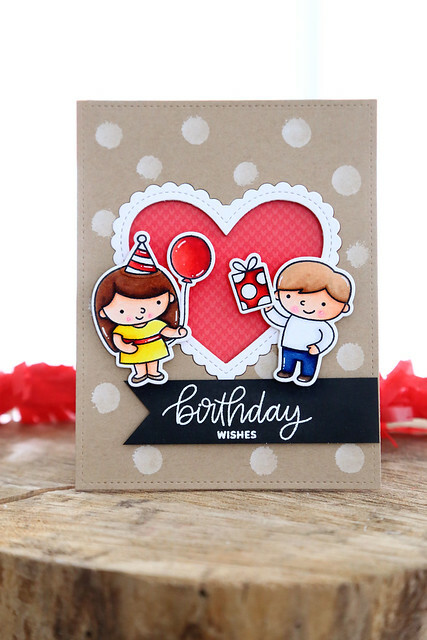 For my next card, I used the other 2 kids in the Birthday Friends set, and the new Love Shaker die. 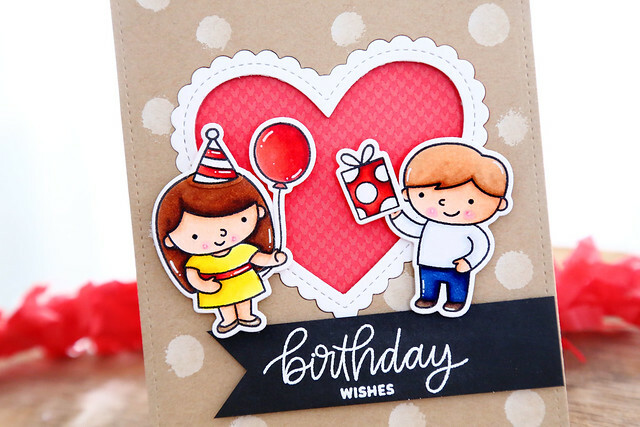 I snipped the word "love" from the die and was left with a fun heart frame for the background. My last card is completely 1-layer. 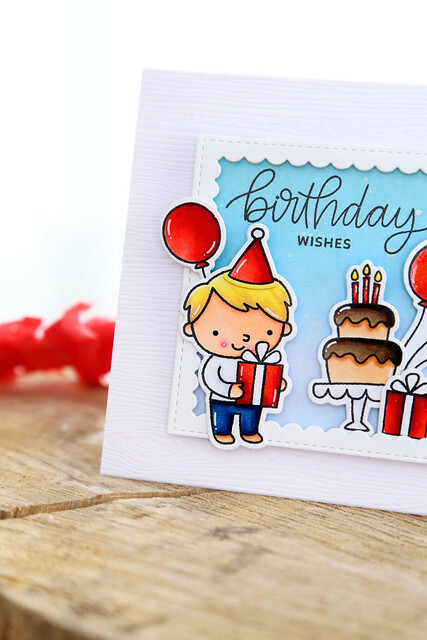 No special design, but I admit I wanted to color the Birthday Scene stamp - it is so cute! 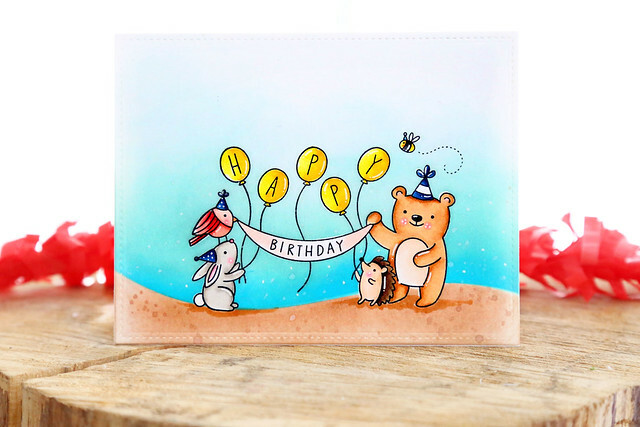 I stamped it, then masked all of the animals and balloons and banner, and sponged a sky and ground. I then splattered brown ink onto the ground and white ink onto the sky. When I removed the masks, all I had left to do was to color the scene. My Maia was going to a birthday party last weekend, and out of the 3 cards, she chose to bring this one along. It is so sweet! 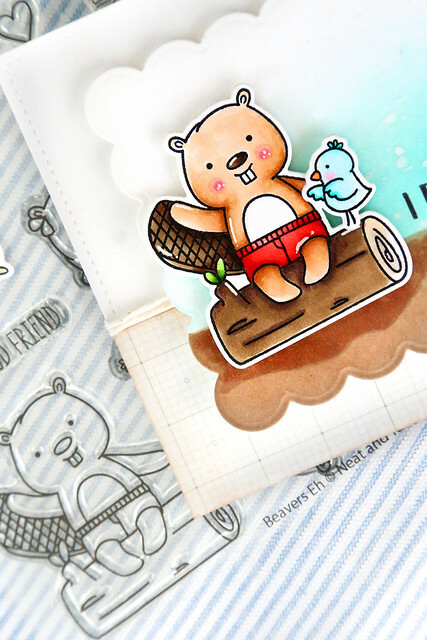 I stamped and colored the beaver sitting on his log, waving a sweet hello with his giant buck-teeth. 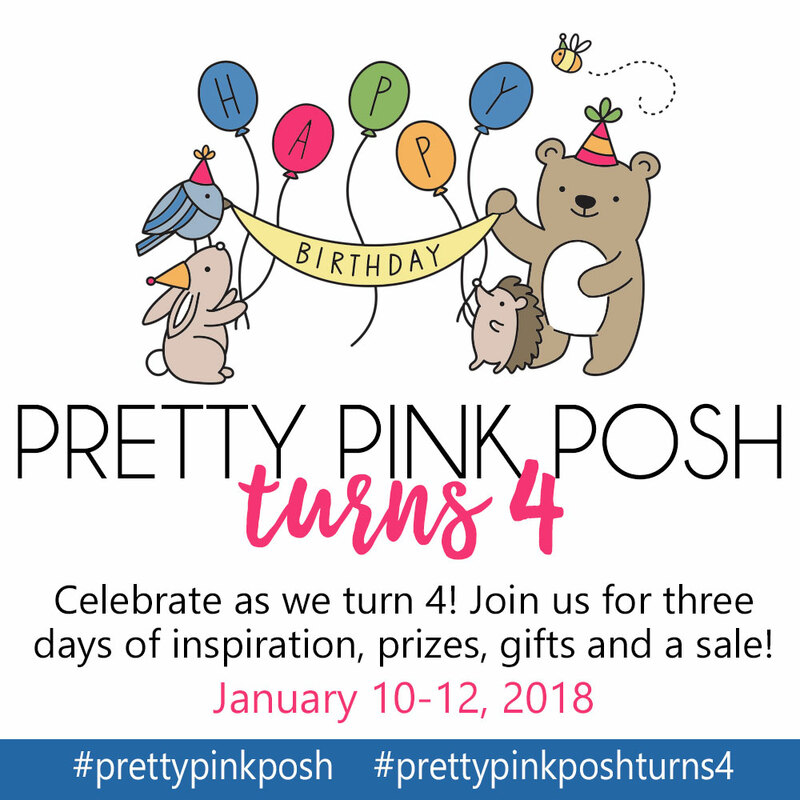 The card design is a uncomplicated one: I cut a Scalloped rectangle, and sponged some inks (both Lawn Fawn: Mermaid for the sky and Doe for the ground.) I then splattered white ink onto the sky and a darker brown ink onto the ground. Beneath the log, I used a copic marker and a heavy hand to add a shadow. 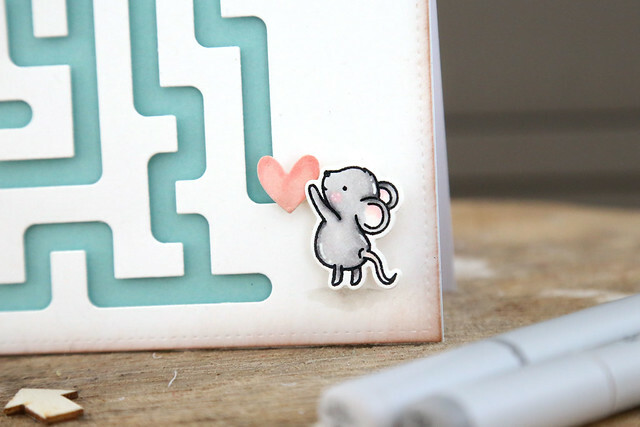 All of the flecks of ink and marker shadowing add depth and interest to this otherwise simple card. 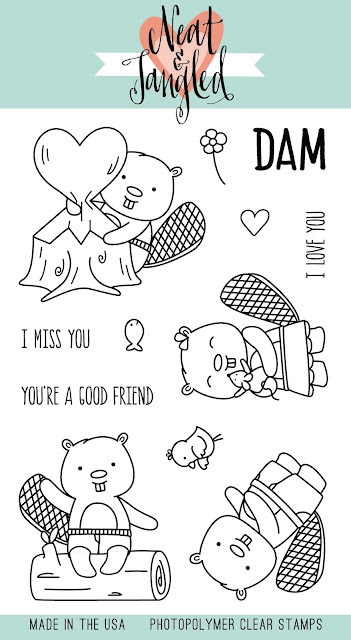 The sentiment, from A-mazing, was the perfect companion to the waving beaver. I love so many of the greetings in that little set. 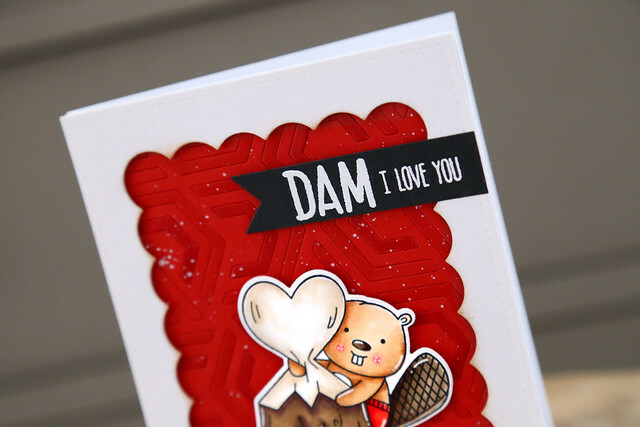 The font is straightforward and would work with so many card designs. I think it's a must-have. 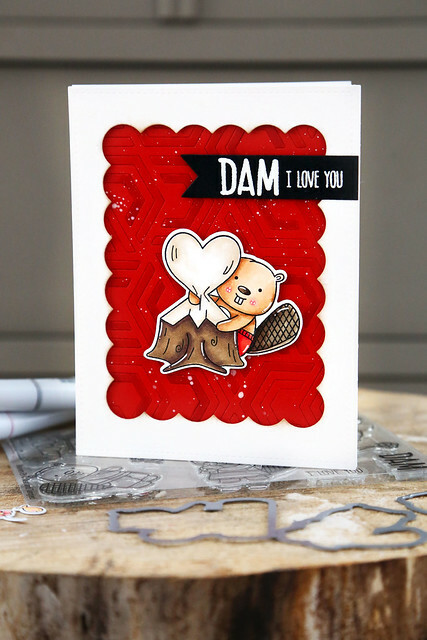 A bit of patterned paper attached to the card-base, and a threading of plain twine finished off the card. Beside the beaver, I placed his bird-friend, who woke up with a cute case of bed-head. The little feathers on top of his head make him extra adorable! 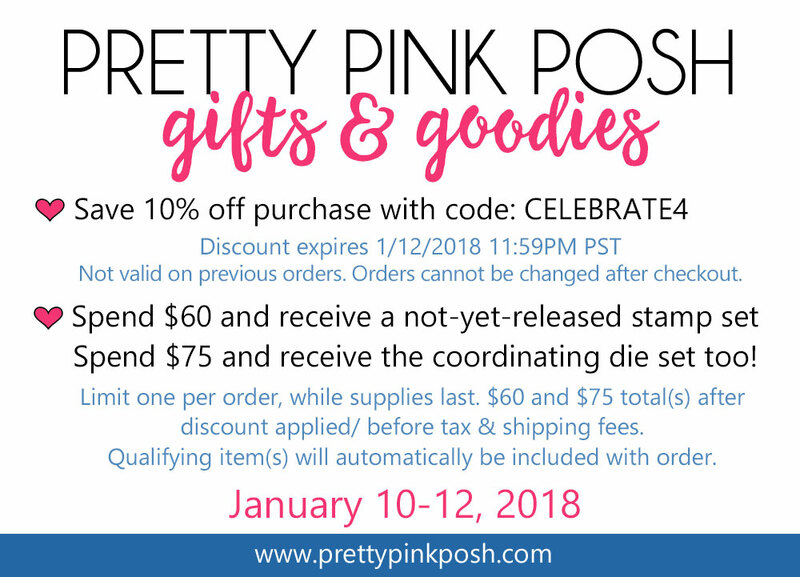 I hope you've enjoyed my card for today, and thanks for stopping by! 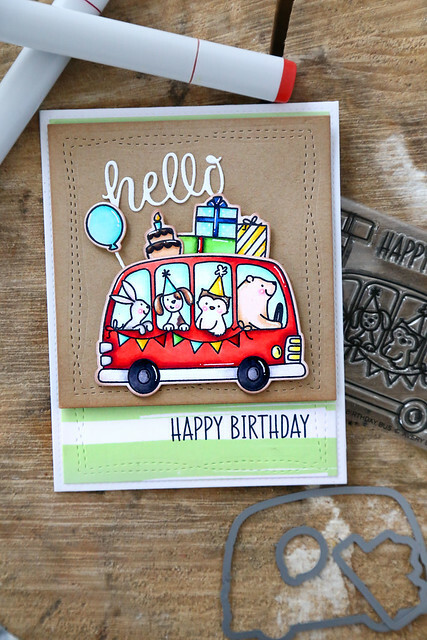 The new Neat and Tangled release is available right now - click! 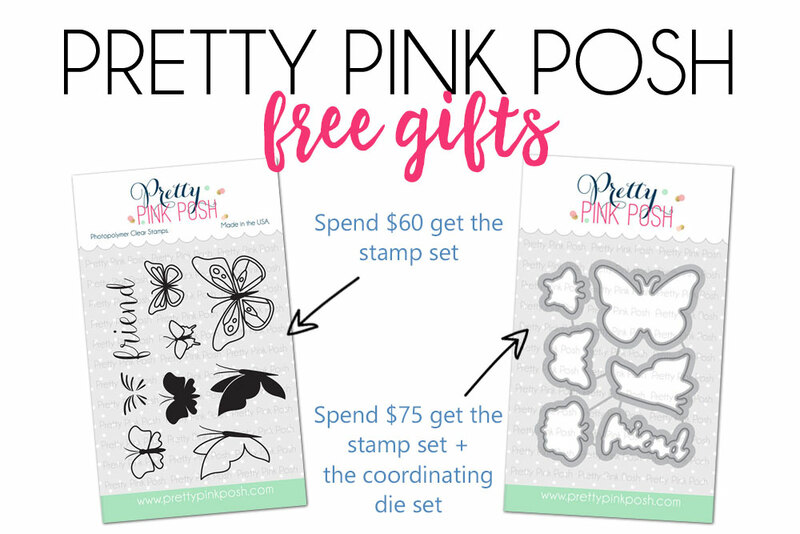 I can't wait to see what you make with these sets! 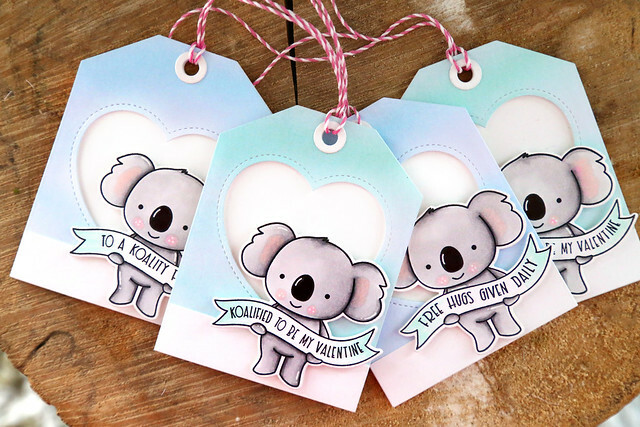 On the last day of this month's Neat and Tangled new reveals, I'm thrilled to show off another set that I illustrated: Koalifications. 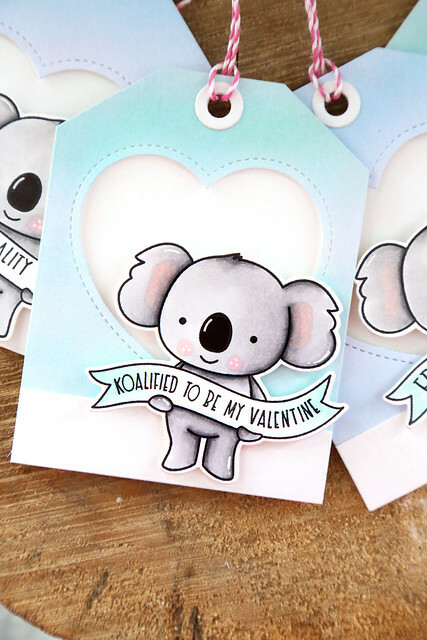 It's a 3x4 stamp set perfect for kid class valentines or quick cards of any kind! 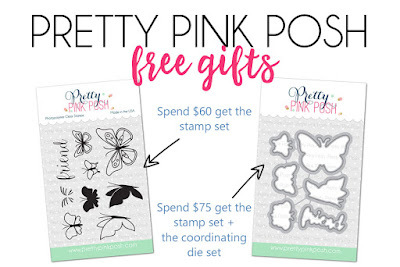 So quick and easy! 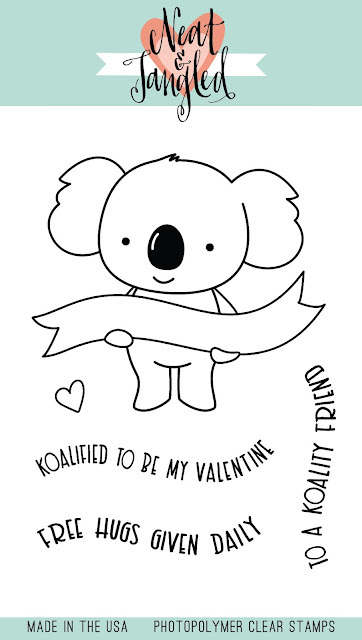 A little tip: if your black ink is drying up a bit like mine was, use a black pen or marker to color in the koala's nose so that it looks perfect! I love his big nose! Do you still make little valentine treats for your kids' classrooms? Only Maia is young enough that she still enjoys handing out little treats for all the different holidays. 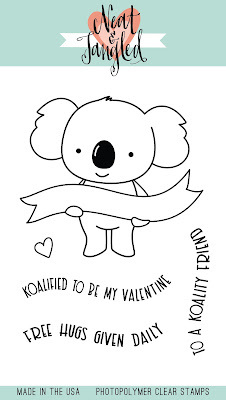 I'm thinking of stamping out a ton of these koalas and letting her color them in - that's the time-consuming part! This is my favorite sentiment! 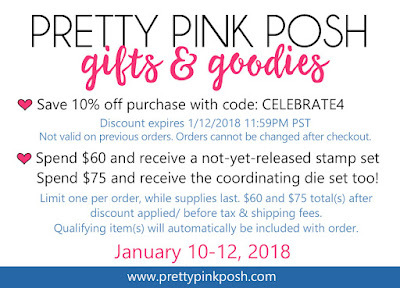 I could also see leaving the banner flag blank and writing in the recipient's name - that would be so cute! I hope you like this little guy! Be sure to drop a comment here before you go check out the NT blog this morning - click! He chewed up a little heart for you, hee hee. I love him peeking around the corner. I heat-embossed the sentiment onto a black banner die-cut so that it would stand out. 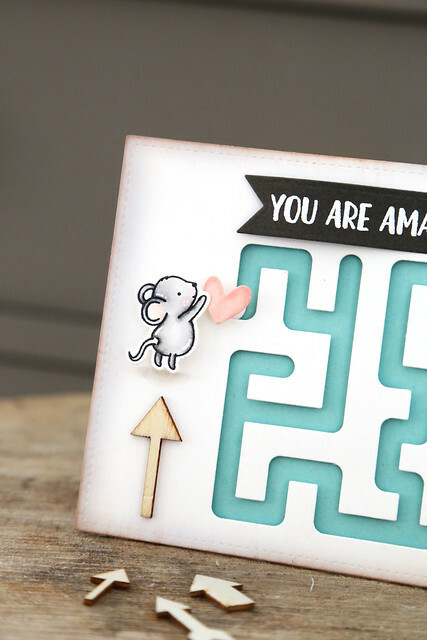 Welcome back to the second day of this month's Neat and Tangled release week! 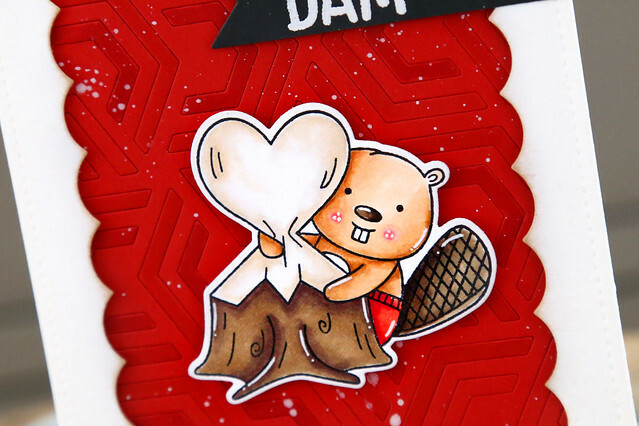 We're showing off a set that I illustrated, called Beavers Eh. The name of the set was a total joke that stuck. ha. A little Canadian fun. My card features 2 of the 4 beavers included in the set. 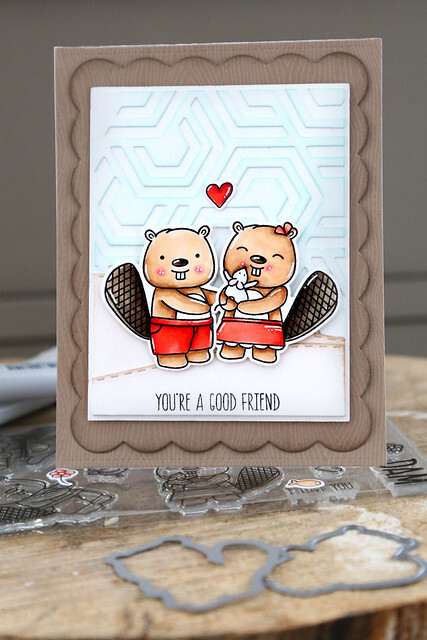 The boy beaver on the left has his hands outstretched to hold either the flower, or the fish, but I thought he looked like he could have his arm around his best gal. I used the new Nesting Hexagons cover-plate (you'll see more of that one tomorrow) to add interest to the background, and Stitched Slopes to give the animals a ground to stand on. Their long teeth are amazing. I had front teeth like that before braces. no joke. Also, the girl beaver's cheeks are almost pinchable. I hope you like what you see so far! 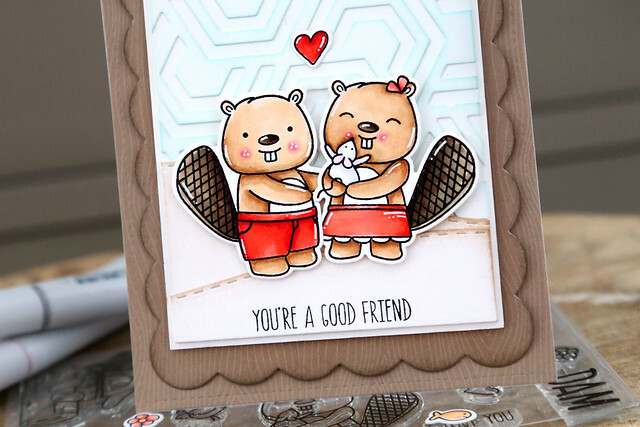 Be sure to leave a comment before you click over to the NT blog to see more of these Canadian-made cuties. We're starting out 2018 with a fantastic Neat and Tangled release. 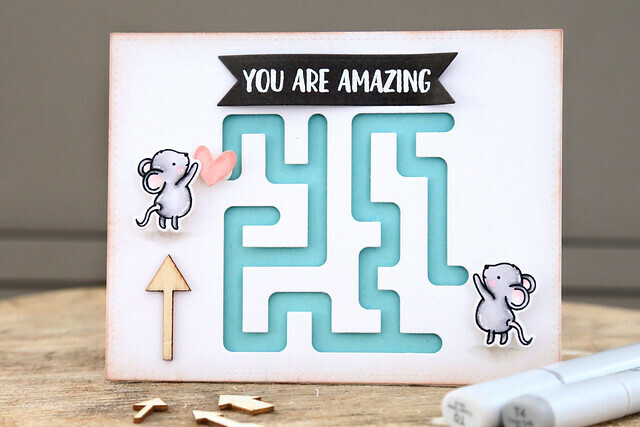 Today's project features A-mazing - a fun set of sentiments that work to compliment the matching maze die - designed by the always innovative Miriam Prantner. I borrowed a couple of mice from Schoolhouse, and had them send a heart through the maze to each other. Isn't it so cute? Because the tract is so detailed, the heart won't spin down. You do actually have to move it through the maze yourself, but my kiddos had fun playing with it. I can't wait to make a birthday card: a critter or kid on one end, and a present at the bottom? With a party hat moving through the maze? What would you make with this die? Visit the NT blog this morning (or afternoon, depending on how much party you had going on last night!) to see what the rest of the team came up with - click! As always, before you go, leave me a comment and you could be eligible to win a 25$ gift card to the NT store at the end of the week.